A "final" picture of PC Keith Palmer taken shortly before he was killed in the Westminster attack has emerged. 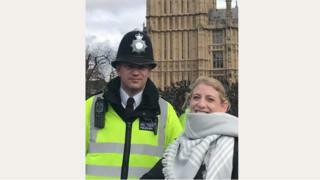 The photo was taken by US tourist Staci Martin as she posed with the officer 45 minutes before he was stabbed by Khalid Masood outside Parliament. Others who also met the police officer during visits to the capital have been paying tribute, calling him a "genuinely nice bloke". A JustGiving page set up for the family of PC Palmer has raised over £600,000. The Metropolitan Police said that as a mark of respect, the constable's shoulder number, 4157U, would be retired and not reissued to any other officer. Ms Martin was on a visit from Florida to London when she asked to take a picture with the officer outside Parliament on Wednesday afternoon. "It's my first time in London and I see his hat and I'm like, 'I have to take a picture of him with his hat,'" she told ABC News. "I walked up to him and said 'do you mind if I take a picture?' He said 'no problem', he was really nice." She said she felt "obligated" to share the photo to his family which she believed must be one of the last photos of him taken alive. Australian Andrew Thorogood posted a photo of himself and his daughters with PC Palmer which was taken during a visit to London last October. Writing on Facebook, the 41 year old said he "spoke with Keith for quite a while and found him to be a genuinely nice bloke". He added that PC Palmer had said "he would love to visit Australia" and his daughters suggested he should visit Alice Springs where they live. "That will never happen now, all because he was doing his job and trying to keep people safe," he wrote. A-level students Will Robins and Tyler Chapperley-Russell had a selfie taken with the PC while on a trip to the capital in 2016. They described him as ''highly professional'' and ''not your 'typical police officer''. Others have also come forward to pay tribute to the late officer's bravery, including a former colleague who said he saved her life during a road accident in 2007. 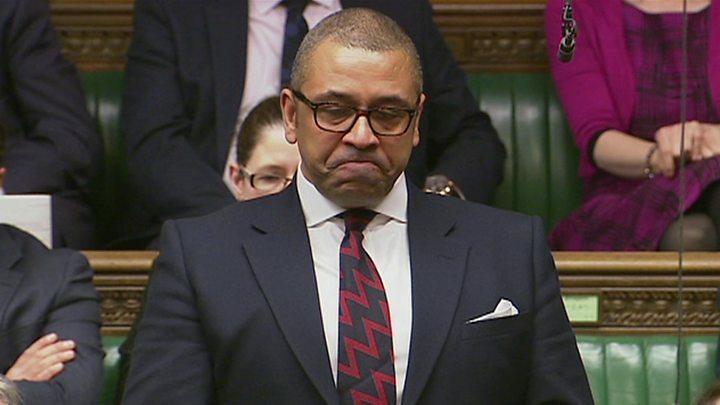 PC Palmer was an unarmed member of the Parliamentary and Diplomatic Protection Squad, who had served in the force for 15 years. He had previously served in the Territorial Support Group (TSG), based in Catford, and in Bromley borough. His family have said he would be remembered as a "wonderful dad and husband". Metropolitan Police Federation Chairman Ken Marsh said the PC's family were "overwhelmed" by the amount raised through crowdfunding sites. "At the moment, there is nothing that can ease the pain of the position they are in... but in time it will help", he said. Many have left messages on the JustGiving page set up by the Federation on Thursday morning. One person wrote that PC Palmer was "a true hero" who had "displayed unflinching gallantry and bravery" while another said "thank you for all you have done for this country". Another page set up to raise funds has also made over £5,000. Have you been affected by recent events? If you are willing to do so, share with us by emailing haveyoursay@bbc.co.uk.